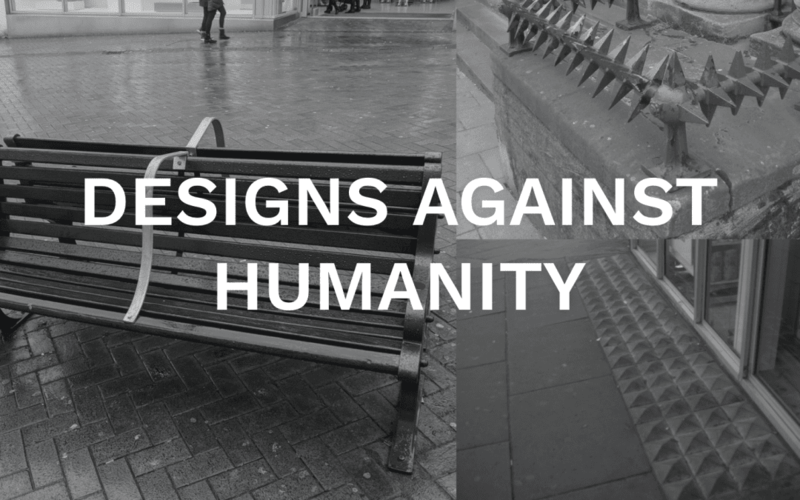 The global anti hostile design campaign HostileDesign.org has been launched to raise awareness and catalogue inhumane, anti-human designs in public spaces around the world. Stuarts has launched hostiledesign.org in an attempt to make it easier to anybody in any part of the world to raise awareness about hostile design and defensive architecture in their own communities. It’s hoped that by helping people to spot (often easily overlooked) hostile designs, prejudicial attitudes can be challenged and ultimately planners and city officials will embrace more compassionate design decisions. It all started when Stuart spotted big metal bars retrofitted to benches in his hometown of Bournemouth on the South cost of England. He was really horrified as they were obviously put there to exclude homeless people from using them as places to sleep. Within 24 hours the photo had been viewed more than a million times alerting the media to what Stuart was calling ‘a design against humanity’. The comments on the post were pretty clear, that most people thought it was horrendous. The immoral nature of these designs had hit a tender spot with people around the globe and the media a started reporting on the Bournemouth bench, with BBC, Elle, Evening Standard, Gizmodo, Buzzfeed and many others raising awareness for the issue. British rapper Professor Green popped down to Bournemouth with his friend Max and and live streamed, on Instagram, them turning the hostile bench into a homeless shelter for just £18. Shortly after, a petition was launched, which gained nearly 20,000 signatures in just a couple of days and the whole movement gained in intensity. 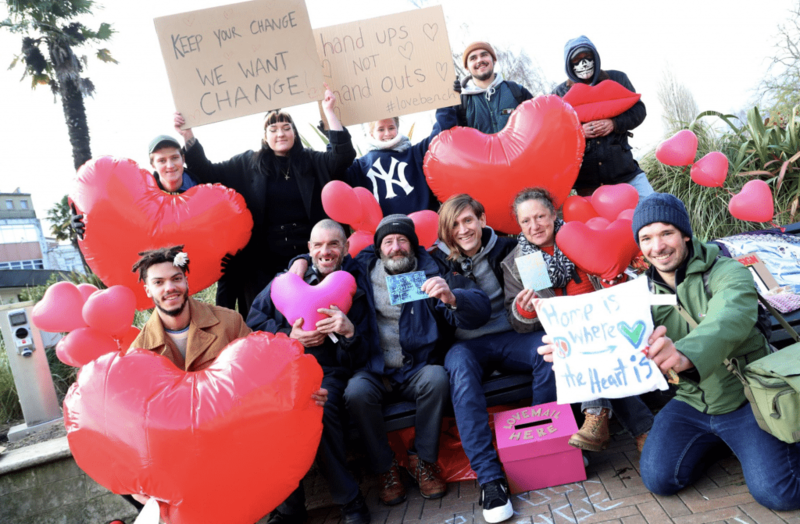 Stuart hosted an impromptu public art intervention in Bournemouth town centre where invited everyone from the local community to come down and turn the hostile benches into ‘LOVE BENCHES’ and show some solidarity and compassion for the homeless people in the community. That night the local council caved under the pressure and attention, finally getting the message and under the cover of dark went out and removed all the bars. In a little over a week, the project showed that when the community uses it’s voice together change can happen! The legacy of the project is that now homelessness and proper homeless services are front and center of the local government’s agenda. We hop to see positive steps to ensure proper inclusion and parity of services and support for those amongst us without a roof over their heads. Now Stuarts has launched hostiledesign.org in an attempt to make it easier to anybody in any part of the world to raise awareness about hostile design and defensive architecture in their own communities. It’s hoped that by helping people to spot (often easily overlooked) hostile designs, prejudicial attitudes can be challenged and ultimately planners and city officials will embrace more compassionate design decisions. If you want to get involved or you’d like more information on the project we recommend checking out the Art newspaper who wrote a brilliant article or hyperallergic’s piece on the project.